He was born Luke Anthony Falcone on October 19, 1669 in Acri, Calabria, Italy. 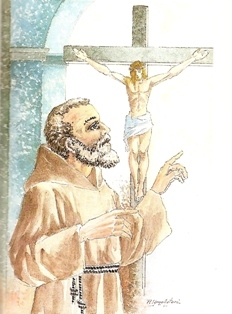 At the age of 18 he decided to become a Capuchin Franciscan, but oppressed by doubts and uncertainties, he left the Novitiate twice; the third time he remained. He professed vows in 1691 and took the name "Angelo". He confided to his confessor that the way he resolved the constant struggle with temptation was through fervent prayer and harsh, personal penances. He was ordained a priest, and dedicated himself to preaching. Elected Provincial Superior, he was called “the angel of peace” for his way of governing the Province. Pope Leo XII beautified him on December 18, 1825. O God, you gave to your priest blessed Angelo the grace to call sinners to penance through his words and miracles, grant through his intercession, that we may be sorry for our sins, and gain eternal life. We ask this through our Lord Jesus Christ, your Son, who lives and reigns with you and the Holy Spirit, one God for ever and ever.